Yesterday the federal government weighed in on a complex topic: what happened to all the oil that spilled into the Gulf of Mexico from BP’s blown-out Macondo well? The joint report by NOAA and USGS lead some, including White House energy adviser and former EPA director Carol Browner, to make the claim that most of the oil that spewed into the Gulf this summer — an estimated total of 206 million gallons — is gone. Collected, burned, biodegraded or otherwise destroyed. Scientists have raised serious objections. OK, let’s take a look at the actual report. According to the “Oil Budget Chart” above (Figure 1 in their report), NOAA estimates only 25% of the oil has been diverted, collected or otherwise definitively destroyed. The remaining 75% is still on or below the water’s surface or buried in marsh and beach sediments (26%); or it evaporated or dissolved (25%), was naturally dispersed (16%), or was chemically dispersed (8%). Evaporation probably has moved a lot of the hydrocarbon out of the water and into the air. But “dissolved” and “dispersed” are not the same thing as “gone.” (Try drinking a nice tall glass of tea with a few spoonfuls of salt dissolved in it, and you’ll get what I mean.) NOAA is assuming rapid biodegradation of the dispersed and dissolved oil, which may be reasonable in relative terms — i.e., biodegradation in the hot Gulf is quicker than biodegradation in the frigid Arctic. But with no data provided on the actual rates of biodegradation, we don’t have any way of knowing just how much of the oil has naturally biodegraded at this point. We also don’t know what the intermediate breakdown products are, and what they do in the environment, and how long they last. Pesky but very important questions that can’t be answered quickly, or without a dedicated research effort that hopefully (??) is underway. Total up the categories NOAA describes as “currently being degraded naturally” and you get 50% of the spilled amount, a whopping 103 million gallons (2.45 million barrels) of oil. That’s almost 10 times the size of the official Exxon Valdez spill. Take the report at face value, agreeing that “only” 26% of the oil remains active in the environment, and you’re still talking about 50+ million gallons, almost 5 Exxon Valdez spills. John, given your measurements of oil that made it to the surface, seem to underestimate the total oil claimed to have been spilled, and given that the few concentration measurements of oil entrained in the water-column reported seem to be quite low, do you have an explanation for the difference? Phil – a great question that will take a lot more study and sampling. We don't know if that is actually happening though – any scientists reading this who are involved in Gulf work, please let us know what you're doing and what your plans are. 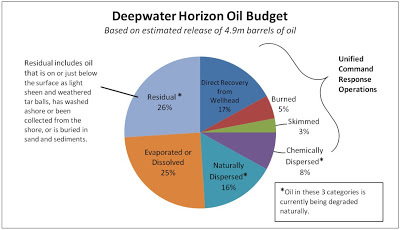 The samples collected so far from subsurface plumes may not be statistically representative of the oil that remained below the Gulf's surface or sank back into the water column after treatment with dispersants. This is further complicated by biodegradation which has been ongoing since the spill began, and is consuming some of the hydrocarbon at an as-yet undetermined rate. 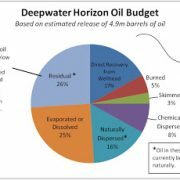 Another possibility is that heavier components of the oil have sunk to the seafloor and are not being collected by mid-water sampling. Hopefully we'll get some answers to this in coming months. Let us know what you learn.